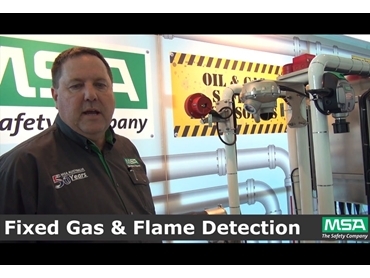 In this video filmed at the Australasian Oil and Gas Exhibition & Conference 2013, National Product Manager John Spokes introduces a range of gas and flame detection systems offered by MSA Australia . MSA's fixed gas and flame detection systems are based on the idea of the 'human analogue' and include scent-based sensors such as the PrimaX I gas transmitter, aural sensors such as the UltraSonic EX-5 gas leak detector and optical systems like the FlameGard 5 MSIR flame detector. Portable gas detection systems from MSA include the Altair 4X and Altair 5X multigas detector. These instruments can be correctly calibrated, monitored and managed using the Galaxy GX2 automated test system, designed for ease of use and capable of simultaneous testing of up to ten instruments.